The Cotswolds inspires everything we make and do and we’re happy to say that we’ve finally returned to the place that captivates our imagination so much. Our stunning new store in Stow-On-The-Wold is now open and we’d love you to pay us a visit. With a beautiful selection of our best-selling ranges and a whole host of new accessories that are exclusive to the store, it’ll give you all the inspiration you need to transport a little slice of the Cotswolds back to your home. Come and see our handcrafted furniture in the flesh and explore why this wonderful part of the world is so special to us. Spread across the ground floor of the historic Unicorn Hotel, our store is a maze of quirky, characterful, Cotswold rooms with low ceilings, stone fireplaces, wooden beams and oak floors. Wander through our kitchen, pantry, parlour, lodge, lounge and more, accompanied by our in-store map to guide your visit. Discover even more styles online from the comfort of one of our sofas (exclusively available to buy in-store!) while slurping on a hot cup of tea made by our lovely team. There’s a lot to explore in this inspiring space and free parking next door, so you browse at a leisurely pace! A small market town, perched on a hill in the heart of the Cotswolds; Stow is a fantastic spot to drop anchor and discover the surrounding villages and towns. It’s well connected and has an abundance of Inns, B&B’s, pubs, shops and hotels to enjoy, all of which are just a short meander from one another. If you love to discover the countryside on foot, Stow is a fantastic place to start your journey. It’s the highest town in the Cotswolds and its elevated position gives some spectacular views on a clear day. When you return from exploring there’s a warm welcome awaiting you in our cosy store and even a place to hang your wellies and give the dog a well-earned biscuit! If milling about unique shops, drinking tea and coffee or eating yummy food is a favourite pastime, Stow has plenty to offer. Huffkins Tea Rooms is a feast for the eyes and the stomach, with its deli-style shop and adjacent tearooms with plenty to tempt the pallet. Wander around the corner to take a look at Stow’s historic church with its unique door, flanked either side by Yew Trees. This unforgettable place is said to have been the inspiration for the ‘Doors of Durin’ in Tolkien’s Lord Of The Rings. Situated above our store, is The Unicorn which has a number of spacious apartments that are perfect for a family trip to Stow. Each come with a handy living, dining and kitchen space, which is ideal if you need to get the kids to bed at a reasonable hour or you just want to avoid the expense of dining out every night. They’re light, spacious and above all, they give you the quickest access to our beautiful store! If The Unicorn is fully booked, why not head to Stag Lodge which is full of quirky rooms and set next door to the White Hart on the market square. The Sheep is also a great place to eat and sleep, with a fine pizza oven and a modern, vibrant interior. 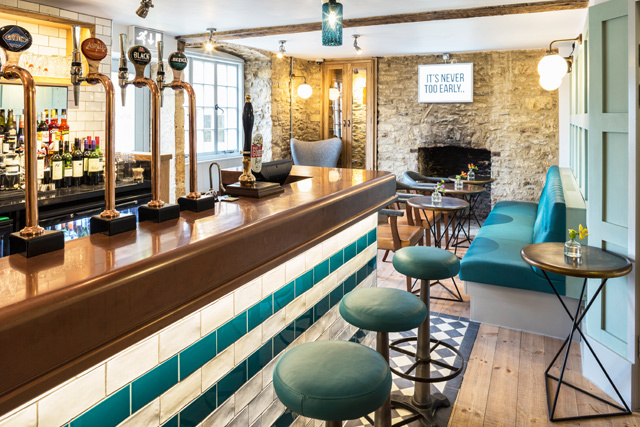 Alternatively, try a room and board at The Old Stocks which has been beautifully refurbished and serves delicious food. There are lots of reasons to come to Stow, not only for its perfectly situated vista of the surrounding Cotswolds but for its own personality and charm. We recommend devoting some time to this historic part of the Cotswolds and popping by to say hello during your visit! If heading west to the Cotswolds is a little too far for you to travel or you just fancy exploring somewhere different, don’t forget we have a splendid store set on the banks of the River Wensum in Norfolk’s ‘fine city’ of Norwich. Let our team of friendly faces guide you through our range of furniture and accessories, before heading off to discover this beautiful, historic city or venturing out onto the Norfolk Broads! We are visiting in the summer for a few days, on our way further South. My sister and I have always wanted to stay in the Cotswolds ever since we read Cider with Rosie at school.